Now is the time to bid farewell and give the last salute to one of the greatest metal rock heroes of all time! 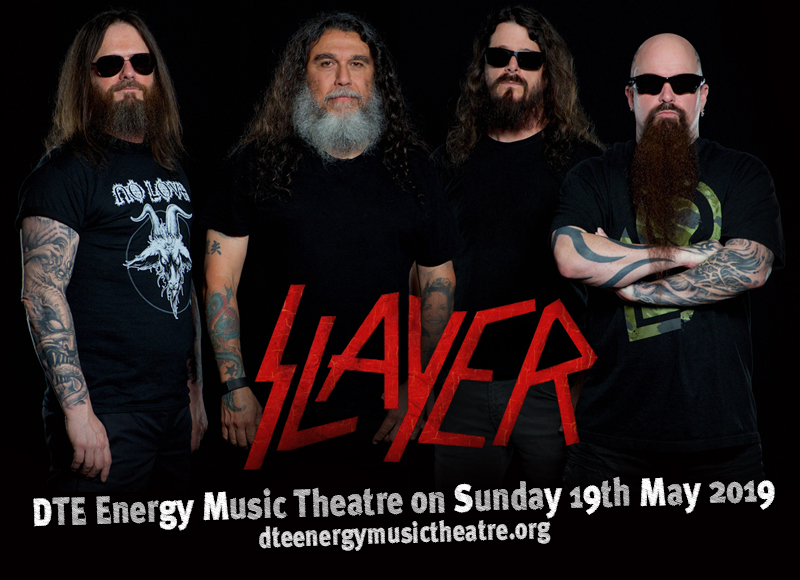 Indeed, Slayer will slay it for one last time as they are bound to conquer the DTE Energy Music Theatre stage on Sunday 19th May 2019. Early last year, these thrash metal icons declared they'll be singing their swan song and taking a bow off recordings and the live stage for good. Yet, before they could actually hang-up their guitars, they heeded the fans' clamor to cover more ground, hence the 'Final World Tour' has taken in more dates, more cities, and even more countries. If you're still not taking this chance for the last time, you'd be wallowing in regret. It's now or never! Book your tickets now! “We’ve heard about fans who have driven five, six hours, or flown in from other cities or countries to see us, so we want to assure our fans that we’ll be on the road through 2019 and will get to as many places around the world as possible to make it easier for everyone to come and see us one last time.” Slayer guitarist Kerry King released that statement to assure their legions of fans that Slayer means business. Yes, they would not just go quietly into the night, but they're out to make as much noise as possible to give fans the loudest farewell bang ever. "The Final World Tour" started in early 2018, trekking various cities and various cities around the world. But Slayer fans are spread far and wide, hence, the band deemed to extend their tour onto the year 2019 so as to cover more ground and reach out more fans even for the very last time. That's slayin' it Slayer style! For over four decades, Slayer's game-changing brand of punk, death metal took the world by storm. Hailed by MTV as the sixth "greatest metal band of all time", the band rock and ruled over the thrash metal soundscape. In their prolific 40-year reign, they released 12 studio albums, raking-in with over five million albums sold in the U.S. alone. Fans adored them and prestigious award-giving bodies like the Grammys recognized their invaluable efforts and contribution to the music industry. Out of four nominations, Slayer picked-up two wins in the year 2007 and 2008 under the "best song" category — ‘Eyes of the Insane’ and for ‘Final Six’, respectively. There'd be no next time. This is it! Take it or leave it facing the possibility of a lifetime of regret. Book your tickets now!